We’ve released Mods 2.0 and now the top question on everyone’s mind is, “When and what are the Sith Raid changes?” We will be launching the changes detailed below along with the release that has the legendary Chewbacca in it, but today I want to walk you through how we are improving the Sith Triumvirate Raid to feel less time consuming and more rewarding. The majority of these changes do not impact the Heroic tier as we still want this to be a difficult milestone to work toward, but the path to get there shouldn’t be as arduous. We want players to master the mechanics while building up a solid roster to be able to complete higher tiers of the raid. As we discussed in our previous post, we are improving the rewards in two ways. First, we’re adding Mod Salvage to high tiers to give Guilds a reason to move up to Tier 6 or Heroic. Second, we’re removing some of the Challenge gear from the rewards that you’re already earning from the Daily Challenges and giving you a better chance to get gear you need to progress to the next tier. We also want to lessen the feeling of “what on Earth do I do here?” that may make you feel like you need to restart the raid multiple times to get a decent damage score. Part of this feeling is from the learning curve of this complex raid and that, we believe, is natural. This should decrease as you play the raid more and figure out the nuances to the mechanics. The other piece though is some of the denser mechanical difficulty that is driven by Nihilus’ Annihilate and Traya’s lightsabers. Both of these mechanics are hard to predict and often drives people to start over when things don’t go as planned at the lower tiers. 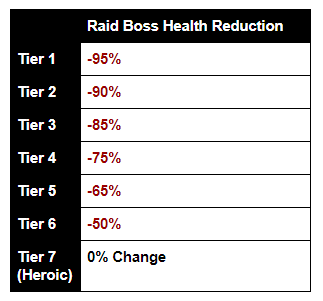 Finally, we have reduced Raid boss health across the board in every tier except Heroic. After playing through the raid with all the changes above, we still felt the time needed to complete the raid was too long, and reducing boss health will speed things along in non-Heroic tiers. Let’s start with our changes to Annihilate in Phases 1 and 4 (All Tiers including Heroic). Nihilus’ basic attack will no longer reduce the cooldowns of Drain Force and Annihilate when they remove a buff. Guessing whether Nihilus was going to attack a buffed ally and then chain into Drain Force was critical to not losing a character early in the fight but it was easy to get caught off guard. Drain Force will still reduce the cooldown of Annihilate but you can predict and counter it with careful use of Unbreakable Will. The next part of the mechanics changes involve Traya in Phase 3 (Tiers 1-6). We have changed Traya’s lightsabers to no longer dispel or apply debuffs based on the buff they start with. The sabers will still have random buffs, but this adjustment will hopefully decrease the need to restart until they get the right combination of buffs on the lightsabers because of the paired debuffs. Last up for the mechanic changes, Boss health has been reduced in Tiers 1-6. This will speed up completion rate and result in Guilds being rewarded more often. This also encourages Guilds to attempt higher tiers more frequently. The chart below shows how much health has been reduced to all bosses at that tier. All of these numbers are still in the final tuning process, but are close to release values. Guilds will be completing the raid faster with the changes above which means more rewards overall. We also wanted to increase the quality of those rewards at the higher tiers of the raid. We could see from the participation data in different tiers that many guilds were skipping tiers 5 and 6 as the increased effort was not worth the small increase in rewards. To address this gap, rewards for Tier 6 and above now include Mod Salvage and we are removing some of the Challenge gear from the AAT prize box that has been stacking up in your inventory because you’re already earning it in Daily Challenges. This will give you a better chance to get the gear you need to progress to the next tier and make the rewards feel consistently better than before. Please also note that we are still doing some final tuning and this may result in a few more minor changes not listed above. We will detail all final changes in the patch notes when this releases. We look forward to hearing your feedback and discussion on these changes.